Sorry for being so quiet for pretty much the entire month, work has been extremely busy and stressful, also there have been builders at home replacing doors and replastering walls for two weeks. I think they are the messiest and most disorganised workmen on the planet, and it’s just typical that I got stuck with them. We now have a dip in the carpet in the hall (broken floorboard) that was fine before they started. I think the landlord will have to replace all the communal carpets as they have done a horrendous job of protecting them from the dust, rubble and wet plaster. I did manage to protect my knitting/yarn stash but there is dust on all my books even though I did put dust sheets over everything. Each footstep sends up a little puff of dust as you walk around. They were working all of last weekend, luckily it was sunny on Sunday as I had to go out!! I grabbed my knitting and did some enforced KIP. Right, enough complaining – there has been some good stuff too. I have ordered some Panda Silk Solid 4ply yarn to knit the shrug I was imagining in my last post. I know I was going to use my raspberry mohair but I need a shrug for a wedding at the end of September so I’m going to knit in the black bamboo/silk and if it works I will probably repeat it with the raspberry mohair. I’m sticking to the feather and fan idea and will knit a few plain stitches between each pattern panel so I can do the shaping easily, I did attempt to work decreases/increases into the F&F pattern but it went horribly wrong, it’s just too complicated and I’m working to a deadline. Hopefully the yarn will arrive on Tuesday and I can get started!! I have cast on the OpArt baby blanket from Knitty.com in white/lilac Patons Smoothie DK which is acrylic, but it doesn’t feel tacky at all. I was being practical – a baby blanket is going to need a lot of washing and if it’s got silly complicated care instructions it will only be kept for ‘best’ which translates as never used in my book. So it’s acrylic. It’s going quite well so far, it is a little dull as it’s mostly just knitting with 4 increases per row but to be honest with work being so complicated I needed a very basic project to do. I didn’t have any brain power left at the end of the day for anything more intricate. Does anyone else wander around almost all day thinking about things they could make if they weren’t stuck at stupid work?? I do. All of the time. On Sunday I watched the dvd of Twilight and was extremely taken with Alice Cullen’s wardrobe. She wears a long sleeved lace knit black shrug in one scene and I have spent all week trying to figure out if I could knit one, in what colour and what yarn. I’ve looked on ravelry and not really found a pattern so I’m now toying with the idea of designing it myself. I’m thinking I could either do a provisional cast on at the back centre and then knit down one sleeve and then knit the 2nd OR knit two sleeves and graft them together at the back with kitchener stitch. I’ve found out that the shrug from the movie is knit in a v-shape lace stitch but I’ve got a yen for one with flared bell shape sleeves so I’m thinking that a feather and fan pattern would make a nice wavey edge and a lovely pattern. I’m was considering black as it would be suitably gothic and would go with everything but then I thought I’d like it to be light and lofty and I have some raspberry coloured lace mohair so now I’m thinking about that. I’ve considered that I should use a big ish needle size so that it’s not too tight and will use less yarn as I have only one skein of the raspberry. And I haven’t written a word of this down until now! I’m also thinking about attacking a white shirt that I got for a few quid in Asda. It’s made of really cheap thin cotton so it isn’t as opaque as I’d like so I may add a ruffle or some lace detail around the neckline/buttons. I’ve just been in the ‘junk’ room at my mum’s house looking for a copy of Wuthering Heights. I want to read it as the new paperback version is being cleverly marketed along with all the other ‘black and red’ vampire/gothic books in a certain chain of bookshops. I love the Stephenie Meyer Twilight series and am currently reading the second book by Cassandra Clare so I thought I’d give Wuthering Heights a go. But I didn’t think there was any point buying it when I was fairly sure there would be a copy lurking at mum’s. Well after being distracted by a box of my old stuff and a couple of photos I found WH and then my eye was drawn to this. 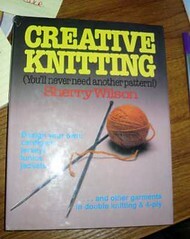 It’s Creative Knitting by Sherry Wilson and was published in 1979 by David & Charles. It proclaims “you’ll never need another pattern!” across the cover so I think it’s more along the lines of the Elizabeth Zimmermann books. 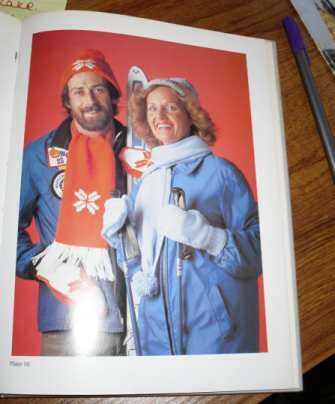 I haven’t had a chance to look at it properly but the photos are suitably dated for a 70s book. However, the introduction starts with a couple of sentences that apply just as well now as they obviously did then. Well I think we would all agree with that. In other news, 2nd knitting group was last Sunday with Ebolajez and Shazspun joining us, which was great. Now we just have to hope that Daintykitty will be over from the US soon. It was a really nice afternoon and we even had our photo taken by an Italian tourist – probably thought we’ve been knitting together for years! !